Its all started when two art and design graduates Rachel Mansur 31, and Florina Gavriel met in 2010 at a concert in LA where they hit it off so fast and decided to hang out the next day so they became fast friends and business partners. 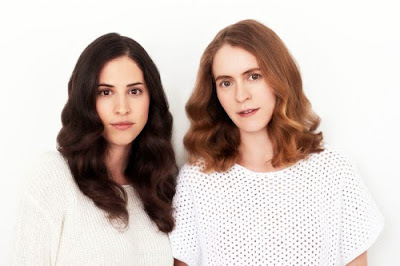 Florina was a tourist from Berlin and Rachel was a residence in LA after Florina went back to her country they communicated and shared their desire to start something that combines commerce and design so they met again in Berlin and developed ideas for what they might do together. And that's how the choice of handbags came in “There were few bag brands at the contemporary price point that held a good value,” said Mansur. So they spent a lot of time searching for the right leather and they made their choice on vegetable tanned leather that is usually used in men accessories which is very masculine so they developed to be delicate in a way suites the brand. Vegetable tanned leather is a high quality leather that gets more beautiful as its ages which fits their philosophy "It’s very special in that it builds up a patina from use, abrasions that fade and build, making the item more personal to you. We also wanted the leather quality to have the luxurious feel of a designer bag, but at a contemporary price point" said Rachel. 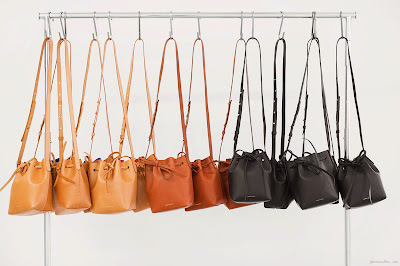 and they started with their famous drawstring bucket and top handle horizontal tote but now they have bigger range of bag designs. By 2012, the product was ready and they had a budget of $100 to photograph the bags styled against pink paper, alongside a few pieces of fruit and a plant, shot in the studio space of Mansur’s mother, who is a photographer. 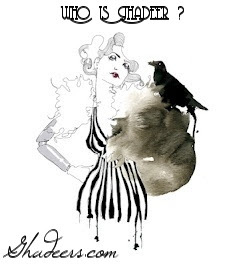 They started emailing their digital look book and line sheet to dozen of shops and boutiques and they booked a booth at the Capsule tradeshow in New York in February 2013 as well people went crazy for them orders were placed by big boutiques including Bird and Creatures of Comfort. But it was Gavriel’s chance encounter with designer, showroom operator and multi-brand boutique owner Steven Alan at an art gallery in New York that provided the initial boost the young brand needed. 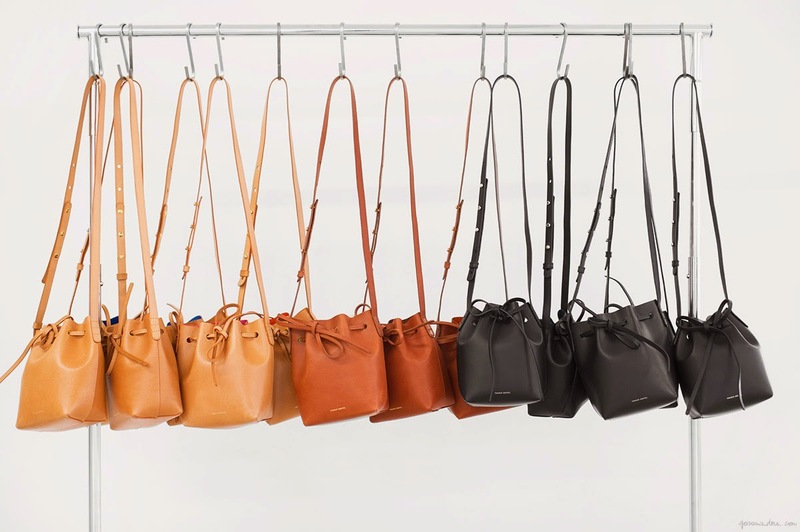 By New York Fashion Week in September of that year, Mansur Gavriel had become the bag of choice for editors and street style stars, as well as Kirsten Dunst, Emma Watson and Miranda Kerr. The Mansur Gavriel bucket bag was one of the three most-searched items in 2014 on personalised fashion marketplace Lyst. After all they moved their brand from LA to New York and started a their company that is functioning there until this day. 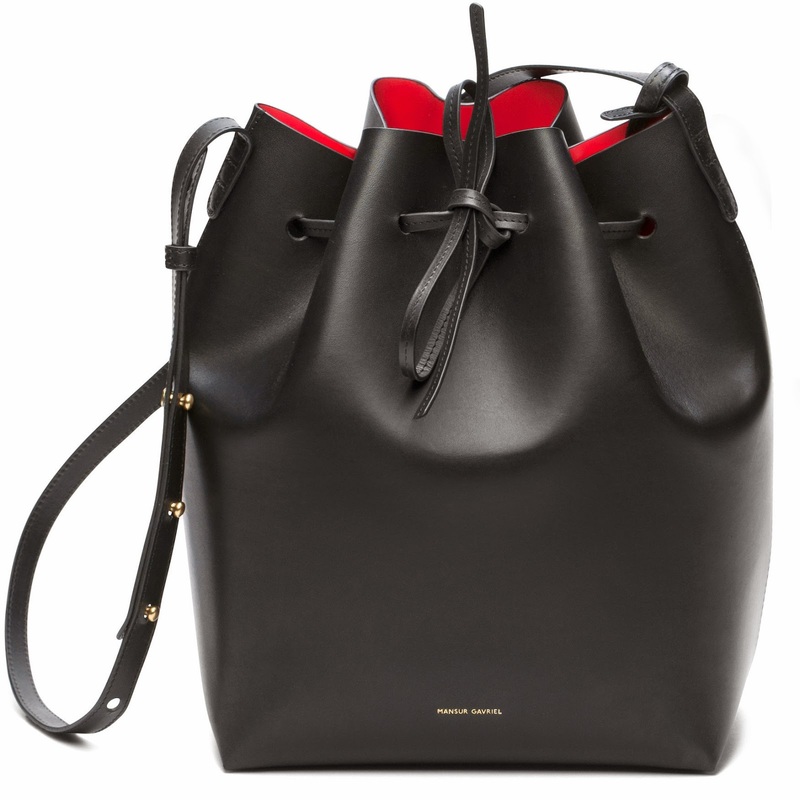 their bucket bag is so beautiful with is minimalist design and simplicity still approaching uniqueness with its colored interior which gave it a vibe and you can really see that the bag stands out with a very approachable price . البداية كانت لمن اتقابلوا خريجتين الفن و التصميم رايتشيل منصور 31 سنة و فلورينا قافرييل في عام 2010 في حفلة في لوس انجيليس ومن بعدها صاروا اصحاب. فلورينا كانت سائحة من برلين و ريتشيل كانت من سكان لوس انجيليس بعد ما رجعت فلورينا المانيا اتواصلوا الطرفين كثير ولاحظوا بينهم اشياء مشتركة كثير وكان في عندهم شغف للتجارة و التصاميم فاتقابلوا بعدها مرة في برلين ومرة في لوس انجيليس وطرحوا افكارهم و طوروها الى ان توصلوا لفكرتهم النهائية الي قاعدين نشوف نتيجتها الان في ماركة منصور قافرييل. كانت الفكرة في تصنيع حقائب لان الكل يحتاج حقيبة لكن بتصميم و خامة عالية الجودة بسعر معقول فوقع اختيارتهم في الجلد على الجلد المدبوغ بالخضار و المواد الطبيعية ميزته هذا النوع من الجلد انه مدبوغ طبيعيا بدون اي مواد ضارة ولا مواد كيميائية و يحافظ على الجلد لاقرب صورة ممكن لحقيقته ياخد وقت كثير عشان ينتج بالشكل المطلوب و يحتاج دقة عالية في التعامل معاه و يكتسب لون خاص مع الزمن بنفس طريقة جلد لوي فويتون كيف مع الزمن يتغير ويكتسب لون خاص. لمستهم الخاصة كانت باضافة بطانة داخلية ملونة اعطت حقائبهم نوع من التميز مع حفاظها على تصميم بسيط و انيق . بعد سنتين من التطوير قرروا يكون انتاجهم في ايطاليا و انتجوا حقيبتين منها الحقيبة المشهورة على شكل الدلو (اعلى حقائبهم مبيعا) لكن اليوم مجموعتهم فيها الكثير من الاشكال و التصاميم . في عام 2012 كان المنتج جاهز و بدأو بميزانية 100 دولار فقط للتصوير و انتاج اللوك بوك الخاص بيهم و ارسلوه لكل البوتيكات المعروفة و حجزوا في اكبر المعارض واهمها في نيويورك و جائت ضربة الحظ في ان الكل حب تصاميمهم وبدات تنهال عليهم طلبات الشراء من اكبر بوتيكات امريكا و اقتنوها اشهر البلوقرز و المشاهير زي ايما واتسون و ميراندا كير. كانت ايضا من اكثر القطع الي اتسوى بحث عنها في موقع ليست. انتقلوا المصممتين من لوس انجيليس لنيويورك و أأسسوا الشركة هناك لليوم الحاضر.